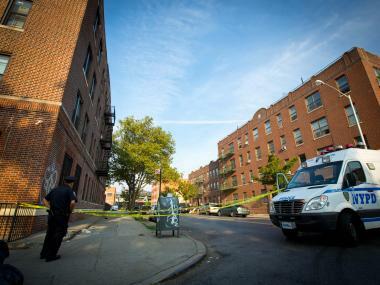 BROOKLYN — A 13-year-old boy became the latest child victim of gun violence when he was shot and killed just a block from his Brownsville home early Friday, police said. Ronald Wallace was shot in the back about 12:40 a.m. at Tapscott Street and Blake Avenue, the NYPD said. Yashana Burrus, 42, who lived by the corner of Blake and Howard avenues, said she heard about seven gunshots. "I came down and there were a lot of people running out," Burrus said. It was not immediately clear if Ronald was the intended target, police said. He was rushed to Brookdale Hospital, where he died. "Only this morning I found out that a 13-year-old was killed," Burrus added. "It's tragic. He's just 13." The crime scene at Tapscott Street and Blake Avenue in Brownsville where a 13-year-old boy was gunned down Aug. 24, 2012. It was unclear what sparked the gunfire and no one had been arrested as of Friday morning, police said. The boy's grandmother, Jackie Thorton, told reporters he was a basketball player at his school, P.S. 323. "He was very smart, he was a lovable kid," she told the New York Daily News. The boy was with friends when the gunfire erupted, and he tried to take off when they scattered, the paper reported. Jasmine, 47 a mother and MTA worker who did not want her last name used, said her 17-year-old son played basketball with Ronald Wallace the day before the young boy was shot. "It's like a war out here, period," she said at the scene of the shooting Friday. "We have to ask how these kids got gun out on the streets." "In the old days, if we didn't like each other, we got into fist fight. That's it." A young girl who said her brother played with Ronald was upset by the shooting. 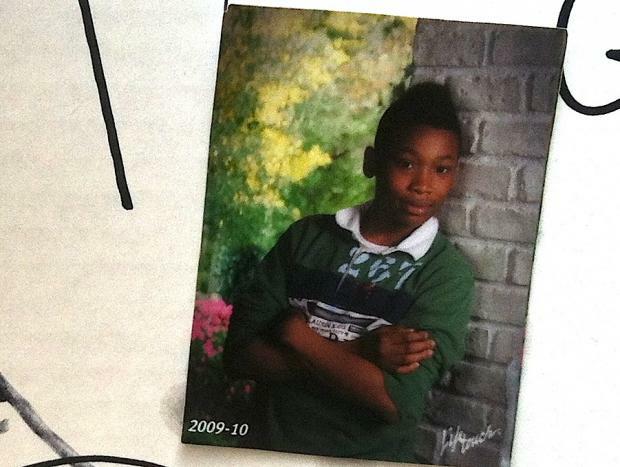 "They shot him for nothing," said Jada, 10. "He's been out here on the streets, but not that much," she added. She said the victim was "cool" and "entertaining." Carl Winston, 57, who lives down the block from the scene of the shooting, said Ronald, who went by Ron, was a friend of his nephews. "They were very upset. The whole neighborhood is upset," he said. He described the boy as "very friendly. He was a good kid. Never did nothing wrong." Family members refused to speak to a reporter outside their home Saturday. The shooting marks the latest incident this summer in which a child was killed or wounded by gunfire. In Brownsville, a 2-year-old girl and two teenage boys were among six victims wounded in a shooting on July 30. Earlier this month, four teenagers were shot on a Brownsville playground. On National Night Out Against Crime on August 7, four teenagers were injured in shootings in The Bronx and Harlem. And, in Bedford-Stuyvesant, Isaiah Rivera, 3, was shot in the leg in a Bedford-Stuyvesant, Brooklyn, playground. All of the victims in those shootings survived. But on July 22 in The Bronx, 4-year-old Lloyd Morgan was shot and killed in a Morissania playground. With additional reporting by Lisa Hagen.